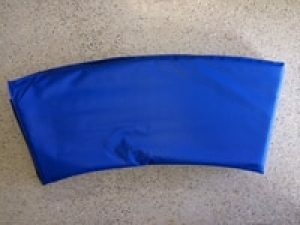 IGT Next Gen 12’ Spring Pad – 100% made in the U.S.A.
A new top quality, 18” wide, spring pad to match our top quality In-Ground Trampoline system. Made with the best American made, 22 oz. vinyl that will stand up to all elements from the blistering sun and heat of southwest to the freezing cold, snow and ice of the northeast. Padded with American made, one inch, high-density foam that will keep the children safe. We use a unique bungee system to secure the pad in place while also giving a bit of shock absorption to the attachment points so your pad will always be right where it’s supposed to be. And the bungees are replaceable if one ever gives way. Sure our new all American pad is expensive but you are buying the ultimate trampoline pad and the best always costs more. Besides we have the only in-ground trampoline pad that carries a warranty. Enjoy your in-ground trampoline and be confident that the pad that protects the jumpers is the best you can get. Only $369.00 including shipping.